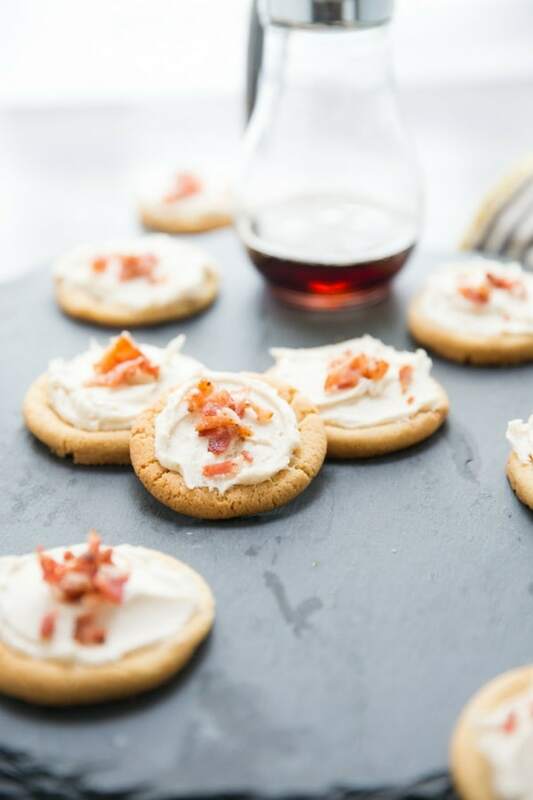 Sugar cookies are loved by many and so is bacon, it seemed only fitting to combine the two in an easy, sweet and delicious maple bacon sugar cookie! 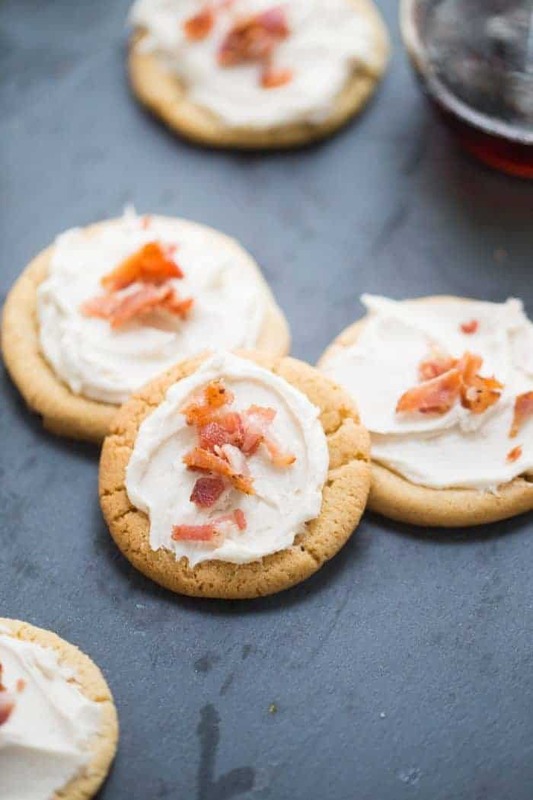 These Maple Bacon Sugar Cookies are a take on my favorite donut. We have an amazing donut shop chain in our city. They are finger linking amazing. Unfortunately, they do not have a shop near our home. However, as fate would have it, a few years ago, family members of that donut shop had a falling out and the daughter walked out with some of those recipes and set up her own shop just a few minutes from our house. The day that shop opened was like a holiday. We were all overcome with joy. They have countless donut flavors that I love, there’s the Butterfinger Donut, Red Velvet Donut, Oreo Crumb Donut, Lemon Donut, and the Caramel Donut. But my favorite flavor of all has to be the maple bacon donut. The donut is so soft, it literally melts in your mouth and the maple glaze is silky, sweet and perfectly complimented by the salty bacon pieces resting on top. I know not everyone goes as crazy over this combination as I do, but it really is worth the try. If you like pancakes and bacon then this cookie will make you very happy. The base of this cookie is an amped up sugar cookie recipe. Not only does the cookie have maple syrup in the dough, but it also has a touch of bacon grease. The grease adds a deeper, richer flavor, but you could always replace the grease with additional butter if the grease weirds you out. The frosting is a simple maple buttercream, but to keep things consistent, the frosting also has a touch of bacon grease. Crumbled bacon is the salty element that pulls it all together. These cookies, and their salty/sweet combo are positively addicting. After you try your hand at these cookies, you can graduate to Bacon Cinnamon Rolls with Maple Frosting or just enjoy these cinnamon pancakes with candied bacon. 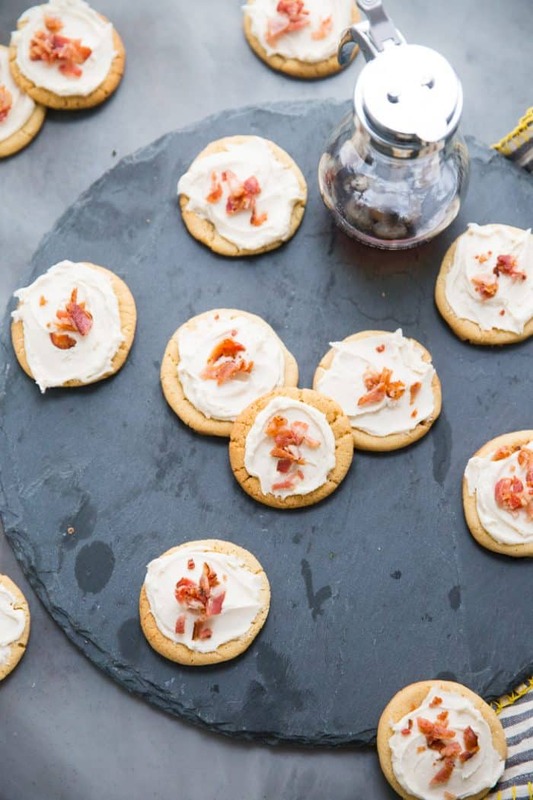 Maple and bacon are meant to be and nothing helps that union shine more than these maple bacon sugar cookies! 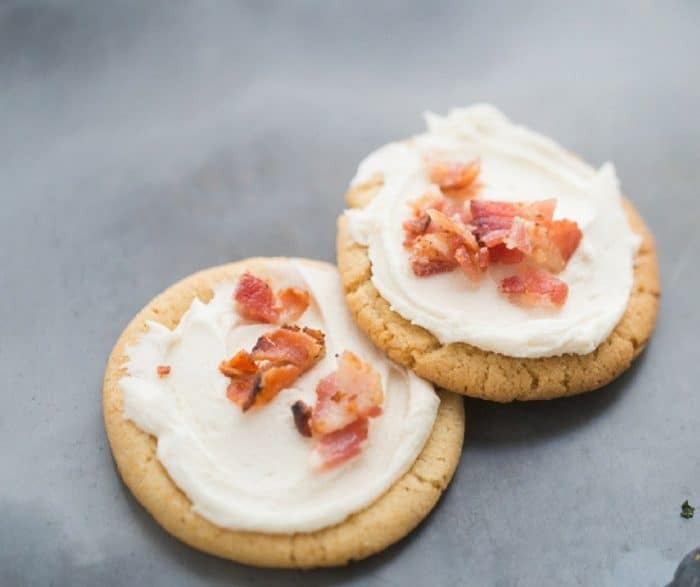 Sugar cookies are loved by many and so is bacon, it seemed only fitting to combine the two in an easy, sweet and delicious cookie! Preheat the oven to 350 degrees. Line baking sheets with parchment paper and set aside. In the bowl of a mixer, cream together butter, shortening and 2 tablespoons of reserved bacon grease. Add sugars and maple syrup and beat until light and fluffy. Beat in egg yolks one at at time mixing well after each addition. Add vanilla. Combine flour, salt and baking soda and cream of tartar. Slowly mix dry ingredients into wet ingredients and mix just until combined. Scoop or roll a tablespoon of dough and place on a baking sheet. Bake for 12 minutes or until golden. Remove cookies from oven and allow them to cool for 2 minutes on the baking sheet; remove to a cooling rack to cool completely before frosting. To make the frosting, cream together the butter and the shortening. Slowly beat in powdered sugar one cup at a time. Stir in maple syrup and reserved bacon grease if using. Add heavy cream as needed to achieve a spreading consistency. 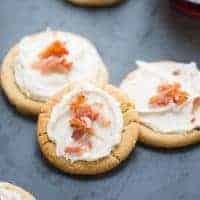 Frost cookies with icing and top with crumbled bacon. I used all Kroger brand products for this recipe. Please use real maple syrup for this recipe.